A cricket commentator’s sole objective, when radio was everything, or still is today, in some places, is to report what was, as it was — without the benefit of instant TV pictures. There ends the comparison. Reason — whatever the medium, a cricket commentator ought to have an intense penchant for detail, not personal prejudices, or a strong irrational impulse. Because, he — sorry for the gender bias — cannot be ‘held’ for his actions, more so, when his passion becomes compulsive. Dignity, therefore, lies in his calling a spade, a spade. Besides this, a commentator’s plea for accountability should be immense. However, by relating things as he has found them to be, he may also sometimes be daunted by his own sense of commitment — the human side of all vocations, big or small. 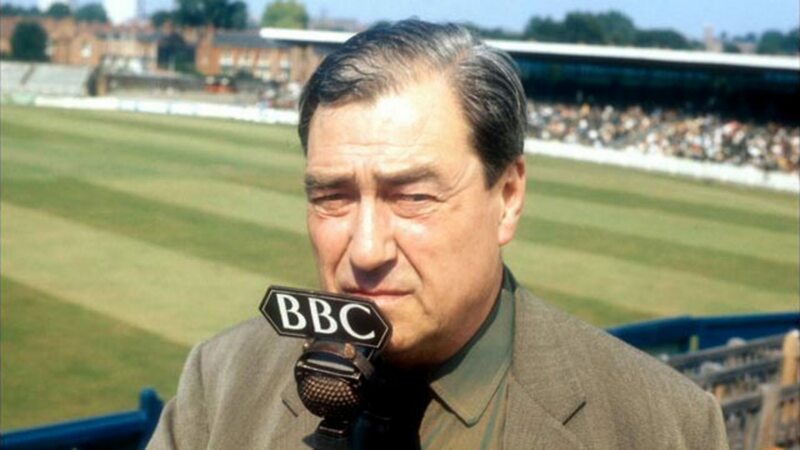 If ever there was one individual who could fit the description of an ‘ideal’ commentator, it was none other than England’s John Arlott [1914-1991]. Arlott was, indeed, cricket’s golden voice, chronicler, correspondent, writer, connoisseur, a one-time Detective Sergeant in the British Police Force, producer with the BBC, general instructor in the Bush House’s Staff Training School, and Liberal who contested a seat in the Epping Division. A giant of an intellectual, and a man of many hues, Arlott exemplified a unique persona, replete with varied interests — a writer with phenomenal reach and grasp. Author of numerous books, ranging from volumes of poetry to works on wine and cheese, aside from cricket, the sport he loved so much, and its players. He was, indeed, one great institution. A fountain-head of knowledge. A genius, right out of some fairy tale. As a cricket writer, Arlott was full of charm and poetic licence. He was a superb raconteur and historian on anything connected to the game. Peerless in every sense, Arlott’s voice will never fade. Arlott, in print, was a definition for the apt, as already explored. His sense of history had a singular objective: knowledge, underlined by a form of complete understanding — of logic, not emotion. Here’s one insight into Arlott’s idea of social history: “Games are as truly part of the history of a nation as its work, wars and art. They are a reflection of the social life of the people, changing with it and conditioned by its changes in economy, religion and politics.” A perfect aphorism, if ever there’s one. Here’s another gem — a fitting eulogy on Sir Gary Sobers: “Everything he [Sobers] did was marked by a natural grace, apparent at first sight. When he walked out to bat, six feet tall, lithe but with adequately wide shoulders, he moved with long strides, which, even when he was hurrying, had an air of laziness, the hip joints rippling like those of a great cat. He was, it seems, born with basic orthodoxy in batting; the fundamental reason for his high scoring lay in the correctness of his defence. Once he was established, his sharp eye, early assessment, and inborn gift of timing, enabled him to play almost any stroke.” Freeze-frame, you have the great West Indian’s supreme individuality and genius in front of you, like a portrait. Born in Basingstoke, Hampshire, Arlott joined the BBC, in 1945, as a poetry producer [He worked intensely with Dylan Thomas, at one time]. A year later, he made his ‘debut’ as a Test match commentator and prospered in spite of a colleague’s caustic remark that he had “an interesting mind, but a vulgar voice.” The rest is history. The critic, needless to say, or as it so often happens with their ilk, had ignored life’s greatest catch-phrase: “The greatest [of men] are/were once beginners.” Soon enough, Arlott’s rich rural accent was on song; and, the man’s love for the game made him a legend… in his own lifetime. Although cricket was his prime passion and source of joy, Arlott never allowed his heart to rule his mind. In 1969-70, he announced that he would not be a commentator if apartheid South Africa was allowed to tour Blighty. It was an open revolt against the establishment. More than that, Arlott was too cognisant of human weaknesses. He often admitted that there was a definitive bias in the selection of his ‘favourite’ cricketers, in one of his great books, as there always is, in any personal choice. But, then, it was also true that Arlott had a ‘soft’ spot for a few English players who did not make any impression on the game. When Arlott — who along with such great voices as Brian Johnston, Trevor Bailey, Christopher Martin-Jenkins et al, formed a great team of radio commentators — retired from the commentary box, on September 2, 1980, Australia’s legendary paceman, Dennis Lillee, and England’s distinguished opener, Geoff Boycott — now a much-loved TV commentator — who were engaged in a Test match duel, stopped, during the announcement, along with other players, not to speak of the crowd, to offer their salutation. It was a rare sight, and an accolade never before accorded to any broadcaster in the history of the game. What if Arlott had lived to delight today’s legion of TV viewers, across the globe? Television commentary would have reached a new summit, what with its melodic symphony already in tow — a medley of rich baritone, which is also part of the game’s high-tech finesse. In other words, the likes of [late] Richie Benaud, Bill Lawry, [late] Tony Greig, Ian Chappell, Harsha Bhogle, and several others, would have found Arlott a true broadcasting champion of champions in their midst. Arlott was, indeed, so special. For 34 years — from 1946 to his retirement — Arlott regaled radio listeners and also readers of his imperishable works across the world. When he ‘hung up’ the mike, and bid adieu to BBC Test Match Special, and the commentator’s box of which he had been an indispensable part — a part of a glorious tradition — it was, indeed, a poignant, but memorable moment. It simply elevated the maxim — that all good things must come to an end. All the same, 35+ years on, Arlott’s voice remains just as fresh in memory as the spirit of its cricketing splendour. This was, and still is, his magic. It is also reason enough why Arlott will continue to live and vibrate through his great, inimitable voice, and words, recorded for posterity — more so, for folks who savoured his extraordinary intonation and classy twang. Of cricket commentating that was sheer music to the ear — of melody that stirs our cricketing minds, hearts and souls. There never was, and there won’t be, another like him, again. Wow, what a lovely tribute to the golden, evergreen Voice of Cricket!